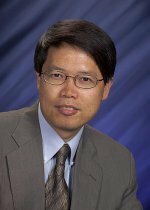 Congratulations to Dr. Yuehe Lin of Pacific Northwest National Laboratory on being selected as a Fellow in the American Association for the Advancement of Science. The AAAS is the world's largest general scientific society and publishes the journal Science. The association gives the honor of Fellow to members who have made particularly distinguished scientific contributions. Lin's research delves into nanotechnology, or devices made with tiny particles that are a hundred thousand times smaller than a human hair. He's developing chemical and biological sensors made with nanomaterials like protein cages as well as quantum dots, graphene, and carbon nanotubes that interact with enzymes, antibodies, and DNA. The technologies he's developing can detect biomarkers, explosives, and pesticides. One day, these technologies could also be used to deliver drugs to fight diseases. Lin is a Fellow at PNNL. He is a prolific author and has edited and co-edited several books on nanotechnology. He also is the associate editor of the Journal of Nanoscience and Nanotechnology, as well as a member of the editorial advisory boards for several international scientific journals. He has over 10 patents and more than 200 publications. Many of these publications have been cited extensively.